Dining chair upholstery going the extra mile. We had an interesting situation where our client has a residence in Brisbane but he is currently working out of Singapore. His love interest lives in San Francisco and she is waiting for a visa to come to Australia. 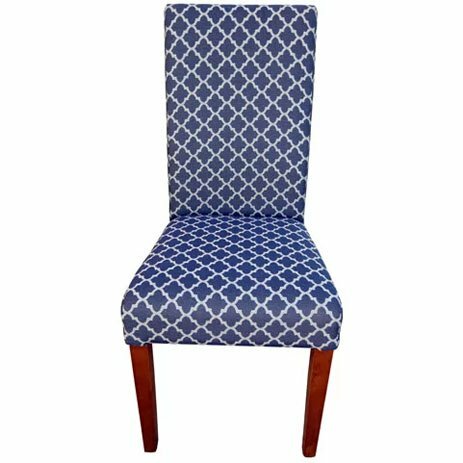 Our client had made a fabric choice for his dining chairs and was thinking of having two feature chairs in a different fabric. So he asked to have some fabric options photographed and emailed to him. We did just that. So when he saw his partner in the US, they decided on the fabric option Bangla Night from Warwick Fabrics for all the chairs. So this is what we call, ‘Fabric Selection Long Distance’. The client was happy with the result. So please contact us for a quote on your on your dining chair upholstery needs. We are more than happy to go the extra mile for you.